Here's another quick character study. More like a character type rather than a specific character. 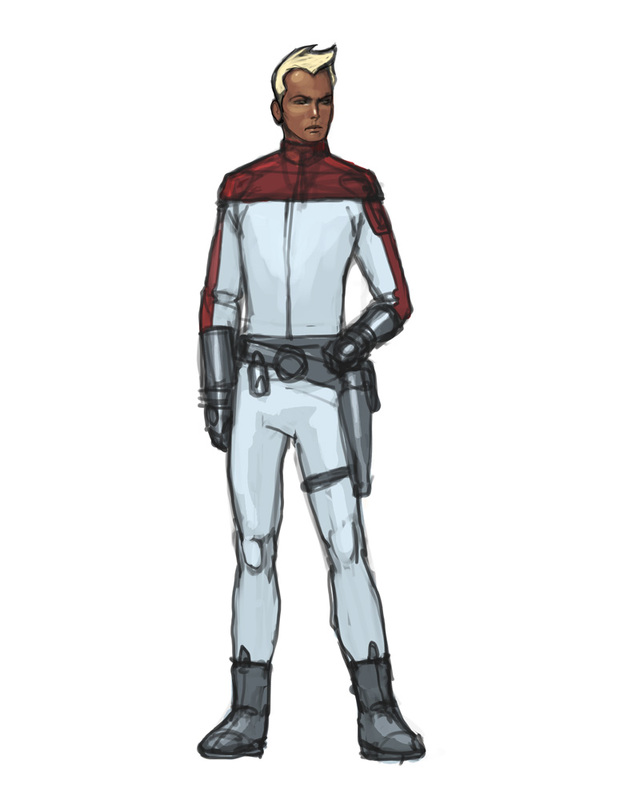 I was interested in doing a Flash Gordon kinda guy, except not so blatantly Caucasian. Nothing wrong with Caucasians, some of my best friends are Caucasian! Anyway I imagine there will be a lot more iteration on the main guy. On another note, today I left my long time day job as principal concept artist at High Moon Studios to pursue freelance work full time! So, if you are a game company in need of some concept art assistance, please look me up. Nice sleek character designs. I love space operas. All of them Battlstar Galactica, Space 1999, The Black Hole. Yeah I am a freak for them. Here to it coming out the way you want. Nice stuff. I've been following you're stuff online for years now. Good luck with your freelance work! these guys look good, but flash gordon was a bot more.. ummm... "flashy" ...think art deco. as opposed to 2001.
butterdude - thanks man! yeah me too, I love all that stuff. I've been in the games industry for 8 years, and have yet to work on a shipping sci fi game. aaron - yeah you are right, Flash Gordon was very art deco; I didn't want to just recreate Flash Gordon though. billy - amen to that!